Looking for a reliable and fully licensed local company to take away your Abridge rubbish or junk? Look no further! Away With It is one of Abridge’s leading waste removal companies. We have been providing services to businesses and residents in the RM4 area for more than 20 years. During that time we have built up a large and loyal customer base in the local area based on our reputation for fast, friendly service at competitive prices. We cater for all types of property and provide a full range of waste and rubbish removal services, from house, garden, garage and office clearance to clearance, DIY and builders waste removal and a daily commercial waste service and operate 7 days a week and offer a same day service so you can call us in the morning knowing your waste or junk will be gone by the evening! First appearing as “Heybridge” on the Saxton’s Map of Essex in 1576, Abridge lies on the historically importance stagecoach route between London and Chipping Ongar. It has been an important crossing point of the River Roding for centuries, and as a result contains a number of listed buildings, including the Blue Boar Inn and Roding House. Lying to the east of the village is Stapleford Aerodrome, formerly RAF Stapleford Tawney. Initially a commercial aerodrome, it served as a base for Hillman’s Airways in the 1930s, which provided a service to Paris and other European cities. During World War II, the airfield played host to a number of different squadrons, including the operational air arm of the Special Operations Executive, the idea being to use aircraft to drop agents behind enemy lines. Today along with another major wartime airfield, the nearby North Weald Aerodrome, it is privately owned and operates mainly as a flight school. Notable people with links to Abridge include former footballer and manager Alan Curbishley, and pop star David Essex. 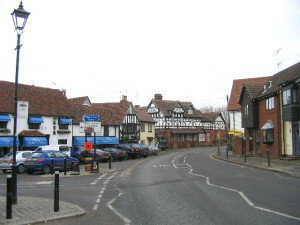 http://www.eppingforestdc.gov.uk/ – Local council website. http://www.essexlocalnews.co.uk/tag/abridge/ – Information, news and events concerning Abridge and the surrounding area. http://www.ericpickles.com/ – Your local Member of Parliament.